Some call Prince Akkanantan Egypt's greatest export but to his opponents, he is nothing but an evil dictator who is greedy for power and money. 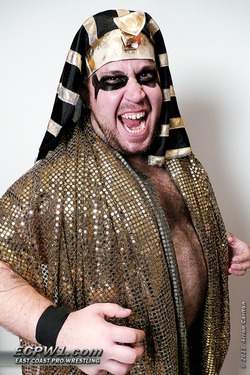 Once a full ally of the former Army of Darkness, Akkanantan has unleashed a reign of terror on the ECPW Keystone lockerroom. After being vanquished from Keystone by his former friend Jake Saint back in August 2010, Akkanantan returned to Keystone just in time for the King of Keystone Tournament and won a qualifiyng match to gain entrance into the tounament. Though he lost in the finals, Akkanantan remains determined to gain as much exposure as he can in the hopes to make the Keystone Championship his greatest treasure. He took his biggest step toward greatness when he joined forces with Elite International, making the already dangerous team even deadlier. In late 2011, the Prince quietly vanished from Keystone once again. On November 24th 2012, Prince made a surprise return to Keystone at the Keystone Rumble. It was announced to Keystone Investors that Prince signed a new contract. Shortly after, he vanished once again.